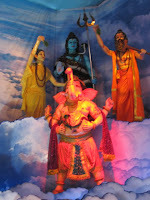 However, yesterday, I felt a sudden bout of energy and decided to go along with my sister to Crawford market in search for a few things for Navaratri… thinking ahead, you see… and then we saw these beautiful Ganeshas there, so I found something to write about today…. 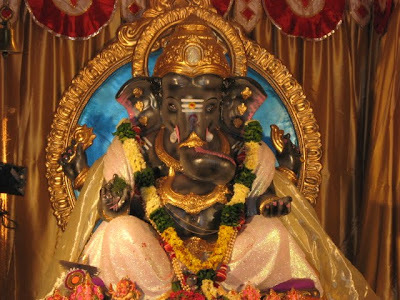 The first Ganesha was right at the entrance to the crowded lanes known for their wholesale shops selling every kind of goods under the sun, located (of all places) in the parking lot! Take a look…. 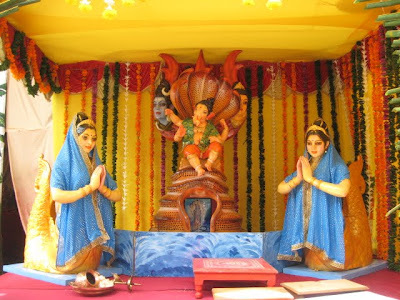 Just outside was this small, but beautiful idol…..
As we wound our way among the crowded lanes, we saw more Ganpati pandals…… all of them blaring out songs…….the crowd halting to pay their respects and causing even more traffic jams…….. 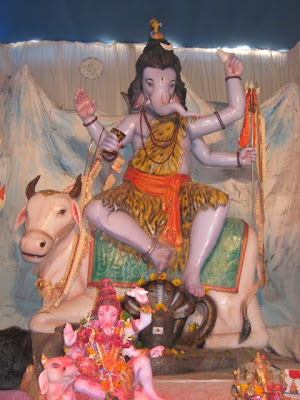 This one is the main Ganesh at a pandal…. 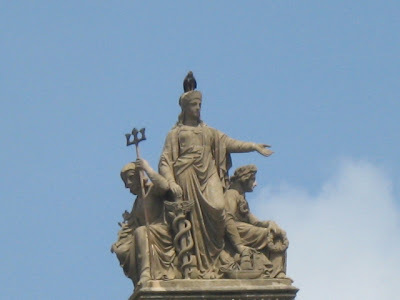 And these are part of the decoration….. 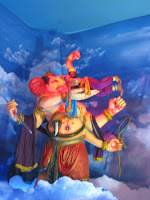 These represent the story of Ganesha destroying the demon Analasura by swallowing him. The demon’s heat proved to be too much for him, and all attempts to cool him proved futile until the rishis showered Dhurva grass on him. 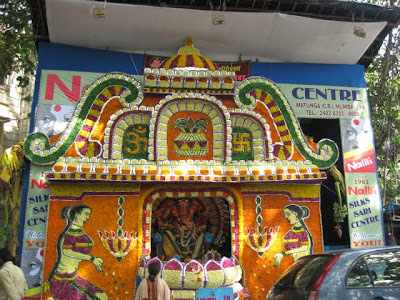 This story is cited as the reason for Dhurva grass being considered the favourite offering for lord Ganesh. 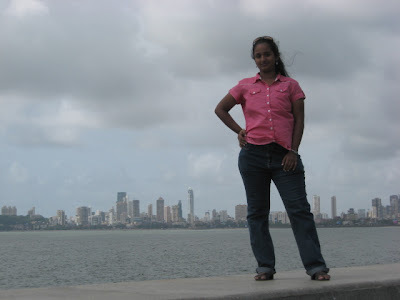 Oh, this post isn’t only about Ganeshotsav……. 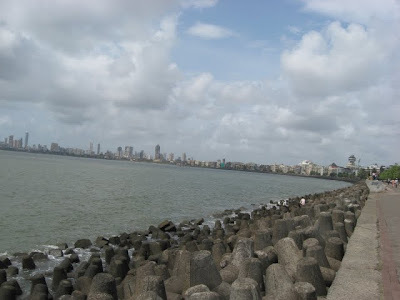 Our work took us towards my favourite area of Bombay – a place which I visited often during my college days, a place which still beckons to me after all these years – Nariman Point….. let me share some pics with you….. 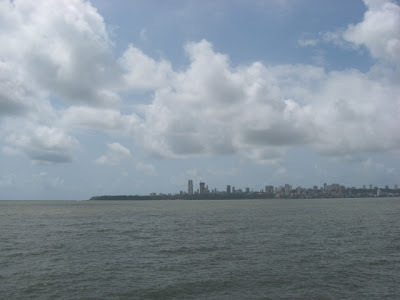 Finally, we turned our back and wove our way back in the growing traffic back home…..
We passed via Lalbaug where the people were queuing up all over the place, past all the other beautiful mandals on the road, but had no time to stop, nor the inclination to stand in one of those long queues………. We were back home just in time for Samhith's return from school. 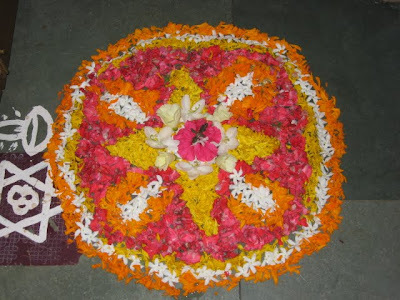 And today is Onam……all around me, there are beautiful kolams (rangolis) made of flowers. Here is my neighbour’s. Wishing everyone a very happy Onam!!!! 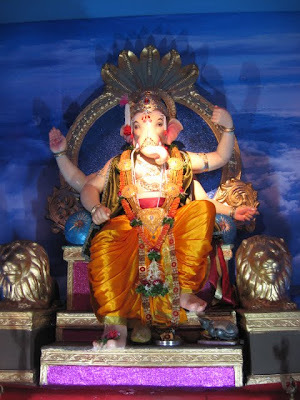 And hoping to be back soon with the last part of the Ganeshotsav……. Bidding goodbye to the lord. Thanks for all the lovely pics, it gave me an idea how it would be like to be in ur part of the world to celebrate this function. I think VT station is part of the UNESCO World Heritage list too.